With a career that spanned nearly three decades, Joe Travers has been on the inside of nearly every aspect of the music industry. A graduate of the Conservatorium of NSW, teacher, author of two music educational text books, a founding member of the jazz Courses at the Conservatorium, composer, arranger/orchestrator, music publisher, theatrical agent and a damn nice guy. Joe was a member of several contemporary bands in the late 60s included The Whispers, The Throb and The Joy Boys and personal Music Director to artists like Normie Rowe, Marty Rhone, 'Johnny Farnham', Bryan Davies, Little Pattie, Lucky Starr and finally the great Winifred Atwell. Joe headed the Joe Travers Band for 6 years at Fairfield R.S.L. then a further 4 years at the Mosman R.S.C. Joe's guitar playing can be heard on hundreds of radio and television commercials, which he recorded as a session musician. International credits include tours with Lou Rowles, Paul Williams, The Fifth Dimension, Gerry And The Pacemakers, to name but a few. 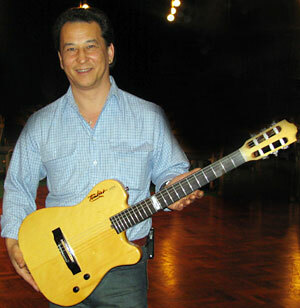 Special Feature: CLICK HERE to view a photo slideshow of Joe's guitar being built, stage by stage!